Richard D. Brown. Knowledge is Power: The Diffusion of Information in Early America, 1700-1865. New York: Oxford University Press, 1989. Pp. ix, 372, illus. Donald Warren, ed. American Teachers: Histories of a Profession at Work. New York: Macmillan Publishing Company, 1989. Pp. 472. Fernande Roy. Progrès, harmonie, liberté: le libéalisme des milieux d'affaires francophones à Montréal au tournant du siècle. Montréal: Editions Boréal, 1998. Pp. 301. Roy Lowe. Education in the Post-War Years: A Social History. London and New York: Routledge, 1988. T.C. Byrne. Athabasca University: The Evolution of Distance Education. Alberta: University of Calgary Press, 1989. Pp. 137. Paula S. Fass. Outside In: Minorities and the Transformation of American Education. New York: Oxford University Press, 1989. Pp. vii, 308. Kathleen E. McCrone. Playing the Game: Sport and the Physical Emancipation of English Women, 1870-1914. Lexington: The University Press of Kentucky, 1988. Pp.310. Theresa R. Richardson. The Century of the Child: The Mental Hygiene Movement and Social Policy in the United States and Canada. Albany, N.Y.: State University of New York Press, 1989. Pp. xii, 273. Arthur Tremblay avec la collaboration de Robert Blais et Marc Simard. 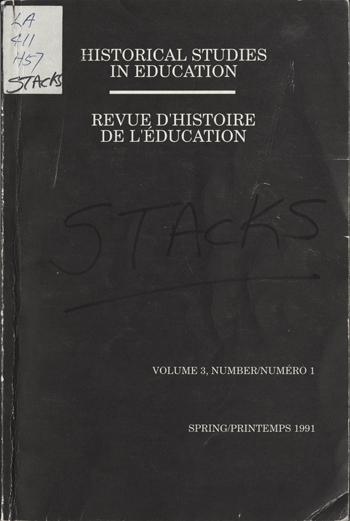 Le ministère de l'Éducation et le Conseil supérieur: Antécédents et création, 1867-1964. Québec: Les presses de l'université Laval, 1989. Pp. 450. Byrce E. Nelson. Good Schools: The Seattle Public School System, 1901-1930. Seattle: University of Washington Press, 1989. Pp.xi,187. Ronald D. Cohen. Childern of the Mill: Schooling and Society in Gary, Indiana, 1906-1960. Bloomington: Indiana University Press, 1990. Pp. xiv, 280. J.R. Miller. Skyscrapers Hide the Heavens: A History of indian-White Relations in Canada. Toronto: Univeristy off Toronto Press, 1989. Pp. 330. John N. Miner. The Grammar Schools of Medical England: A.F. Leach in Historiographical Perspective. Kingston and Montreal: McGill-Queen's University Press, 1990. Pp.355. M'hammed Mellouki. Savoir enseignant et idéologie réformiste: la formation des maîtres (1930-1964). Québec: Instuit québécois de recherche sur la culture, Coll. "Documents de recherche" no.20, 1989. Pp. 392.